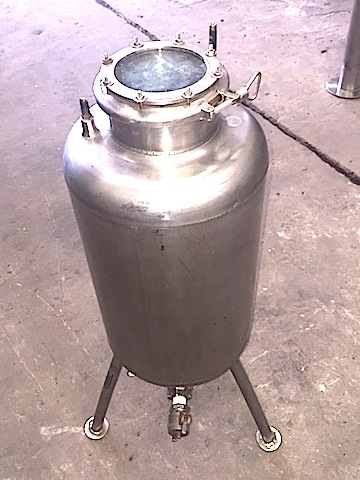 TANQUE ACERO CONSTRUIDO EN INOXIDABLE CALIDAD AISI 316 PARA UNA CAPACIDAD NOMINAL DE 40 LITROS ALTURA 460 MM. X DIAMETRO DE 340 MM. FONDO Y TAPA TORI ESFERICOS, TAPA CON CIERRE CLAMP CON VISOR VIDRIADO DE 300 MM. DE DIAMETRO, DESCARGA CENTRAL CON DUCTO LATERAL DE 1- DE DIAMETRO, MONTADO SOBRE TRES PATAS.